A smile echoes health and wealth. Departure from the ideal—missing front teeth or altered gingival contours—affects self-esteem. 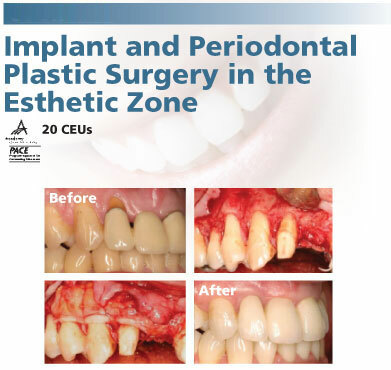 This course trains you to perfect smiles with periodontal plastic surgery and implants. A step-by-step tutorial enables you to refine soft tissue and implant cosmetics. Live surgery and a hands-on practicum solidify your knowledge. The best implant seminar I have attended. It is the perfect combination of didactic and surgical information. Dr. Sonick’s lecture style combines his exceptional expertise with a relaxed delivery. The two days fly by. I guarantee that you will not be bored for one moment. The interactive surgical portion is phenomenal. No question will go unanswered and your level of confidence will be markedly enhanced. This entry was posted by Dental Continuing Education on March 17, 2008 at 7:30 am under Case Acceptance, Hard Tissue Grafting, Periodontal Surgery, Soft Tissue Grafting. You can leave a response, or trackback from your own site. Follow any responses to this entry through the RSS 2.0 feed.